Date: 9.03.2018 | Disco, RnB, Pop, Blues, Rock, Jazz | Tags: Ultimate Mum, The Ultimate Collection, USM Media, Union Square Music, BMG Company, Jona Lewie, Martha Reeves, The Supremes, Dandy Livingstone, The Feeling | Download Ultimate No.1 Mum (2018) for free. Ultimate No.1 Mum is a delightful 5 disc collection especially complied for the most important member of the family. Mum! 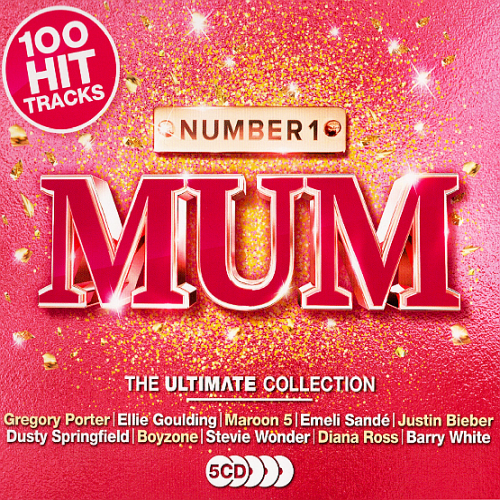 We have gathered 100 contemporary & classic songs guaranteed to be a hit with all mums. We have covered all genres from Pop to Soul, some great 80s classics as well as some good old Motown. The uplifting feel good songs are delivered courtesy of Maroon 5, Nina Simone, Ronan Keating, The Scissor Sisters plus many more. Also included are gentle sentimental songs from Gregory Porter, Ellie Goulding, Etta James, the list goes on. This is a collection that will put a put a big smile on her face and make her groove like she used to. The album is presented in a beautiful eye catching package making this a perfect gift to celebrate Motherss Day, birthdays or any occasion.